Set the mood for serene relaxation with the Archer Leather Power Recliner with Power Head. Boasting of comfortable seating with chaise, padded-tufted back with cozy neck cushions, and sloped wide pillow arms, this home furniture will send you into a slumber within seconds. This contemporary-style recliner is equipped with a power reclining mechanism that allows you to independently adjust the pillow neck cushion and leg rest with just the push of a button. Available in other colors. Like the matching sofa very comfortable. Would highly recommend this chair, nice leather and extremely comfortable. Very comfortable- much bigger in house than they appear in store. Bought two - color and style is great. One downfall is that they have an odd smell (not new leather smell) still after one month. Tilted headrest is key - makes it much more comfortable! Nice, comfortable chair, but several annoying flaws in the work. Mostly comfortsble and works well. I really like the adjustable head rest. I’m disappointed in some of the workmanship.There is an unseen space between the chair and the arm, so when resting my arm, my elbow is on a piece of wood. Very hard, so I’ve had to stuff a cloth in there to rest my arm. Secondly, I reached only about an inch under the chair to move it to clean the floor beneath it and a very sharp tack or staple was protruding from the bottom. I lifted the chair to look further beneath it and say approx, 6 or 7 staples hanging from the fabric beneath the chair. I hammered the ones that I could, but my impression is shoddy workmanship on parts of this chair. We purchased the recliner with the couch, it was delivered a week later and we've been very happy ever since. just like the couch when reclining we usually fall asleep within 10 minutes, SOOOO comfy. Great furniture and customer service! Helpful sales person. Delivery came sooner than expected and the delivery men were great. Great set ! Delivery crew was awesome too ! Very comfortable , good leather. I do recommend this chair to all! very comfortable, easy to adjust and the adjustable headrest is a great feature. Already gave a review of the sofa and chair is the same. Again hopefully both hold out down the road. what is the color called ? 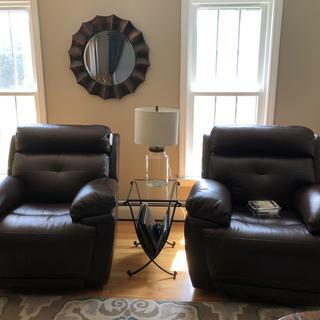 The leather name on this recliner is Archer Davenport. It is a medium brown color.